High performance valve packing for high pressure, high temperature applications. Offering excellent sealing and reliability for both Original Equipment Manufacturers and plant users alike. K3222W is only one of the extensive products in the KLINGER pump and valve sealing range. The range includes compression packings, moulded sets, low emission sets and specialised products. Ongoing Test & Development in line with the KLINGER service and quality philosophy will ensure improved performance in your pump and valve applications. K3222W is manufactured using expanded graphite ribbons each incorporating a fine inconel wire, to produce a valve compression packing of square cross-section with added mechanical strength. The packing has excellent thermal conductivity and thermal resistance. 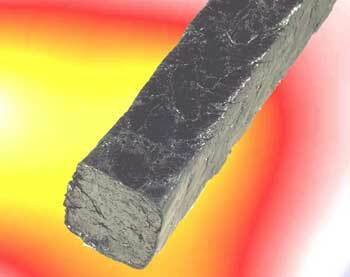 K3222W is therefore unaffected by fluctuations during application such as thermal cycling if installed correctly. Graphite is very resistant to chemical attack by virtually all media except strong oxidisers such as nitric acid, oleum etc. The inclusion of Inconel wire reinforcement ensures that K3222W has excellent dimensional stability and will operate under high stress conditions. There is no need for special die-formed ring sets, K3222W can be fitted using traditional methods from roll, as and when required. This reduces the need for special tooling and stocking of different preformed rings. K3222W is also offered without wire reinforcement as K3222, for operation under lower stress conditions. K3222W is also recommended for cryogenic applications and those services which require low emission levels.